KATHMANDU, JUN 26 – Having completed the groundwork, five Maoist parties are likely to make a formal announcement of their working alliance as early as on Thursday. 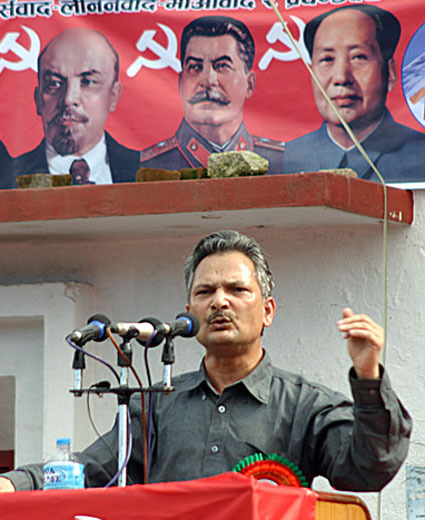 A cross-party taskforce formed by UCPN (Maoist), CPN-Maoist, CPN (Maoist) led by Matrika Yadav, Revolutionary Communist Centre led by Mani Thapa and CPN (United) finalised code of conduct and procedures of the alliance on Wednesday, but failed to agree on the leadership of the alliance. The UCPN (Maoist) has claimed for the leadership, while other fringe Maoist parties are pushing for the rotational leadership. Top leaders of the five parties are likely to forge a consensus on the leadership on Thursday. “We are planning to make a formal announcement of the alliance by Thursday evening. If the leadership issue remains unresolved on Thursday we will announce by Friday,” said Thapa. Leaders say all five parties share a common position on the issue of federalism, forms of governance and providing rights to the oppressed and marginalised communities. Once the alliance is in place, the UCPN (Maoist) will push their agendas inside the Constituent Assembly (CA), while other four parties will hit the street demanding a ‘pro-people constitution’, said Thapa. The purpose of the alliance, according to leaders, is to create pressure in the CA as well as in the street to incorporate the agenda raised by these parties. The five parties are also preparing to raise the issue of national sovereignty, which in the Maoist discourse suggests symbolic protest against “Indian interference in Nepal”. While the fringe parties, which boycotted the November 19 CA election, have been vocal critic of India, even the UCPN (Maoist) has started to raise the issue of national sovereignty of late. Soon after the election debacle, UCPN (Maoist) Chairman Pushpa Kamal Dahal started reaching out to splinter Maoist parties, seeking a party unification. Dahal has even acknowledged publicly that he had committed several mistakes after joining the peace process to win over the fringe parties and seek a chance to lead another Maoist movement. The four communist parties are opposed to idea of promulgation of the new constitution from the CA.